Two aircrafts collided at Halim Perdanakusuma airport in Jakarta, Indonesia, resulting in a wing bursting into flames. 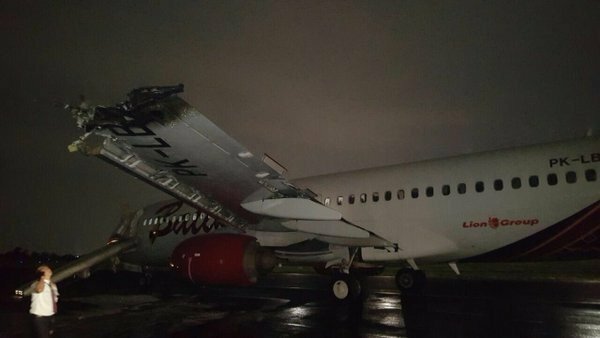 A Batik Air passenger plane was taking off when its wing clipped the tail of a TransNusa aircraft being towed across the runway. Indonesian authorities said there were no injuries in April 4 incident, and all passengers were evacuated safely. Indonesia has had a dismal air safety record amid a boom in air travel, particularly with budget carriers. The incident caused the temporary closure of the largely-domestic airport. The Batik Air plane was carrying 49 passengers and crew, reported AFP news agency. A spokesman for budget carrier Lion Air Group, which owns Batik Air, told the wire news agency that the pilot had aborted the takeoff after the collision, and passengers and crew were safe. Transport ministry officials said the collision had mangled parts of both aircraft. A video posted online shows flames erupting from the Batik Air plane wing.